KAFRANBEL, Syria — The Syrian revolution’s heart — not yet ravished by the regime or Islamist extremists — beats on in the northern town of Kafranbel, where a group of dedicated activists has captured the world’s attention through witty posters and banners that reflect the state of the revolt since spring 2011. And even as the Syrian narrative has increasingly focused on the extremists or an international plan to dismantle the Assad regime’s chemical stockpiles, the artists of Kafranbel have been engaged in their own struggle — to win back the support of residents of their own town. The 40-year-old Raed Faris and his partner, 33-year-old Ahmad Jalal, are the creative duo behind the banners. Faris — a tall man with a booming laugh — writes the banners, while Jalal, quiet and shy, draws the cartoons. Together, they spend their time brainstorming, researching, and connecting with others on how to display Syria’s tragedy to the world. The banners express sophisticated geopolitical analysis in the simplest of forms. They are often inspired by iconic pop culture references: Faris and Jalal have used a Pink Floyd album cover, the Titanic movie poster, and even The Lord of the Rings to describe what is happening in Syria. No side in the crisis was spared — not the Syrian regime and its allies, not the Western powers and the United Nations, not the exiled Syrian opposition, and not even the radical jihadists who eventually came to live among the activists. Banners like this one — along with the famous response to the Boston Marathon bombing — drove home the universal and historic nature of the Syrian struggle. Kafranbel’s artists consistently made these connections to show that Syria’s war was not an event isolated by time or geography. But the world read the banners, and did nothing. 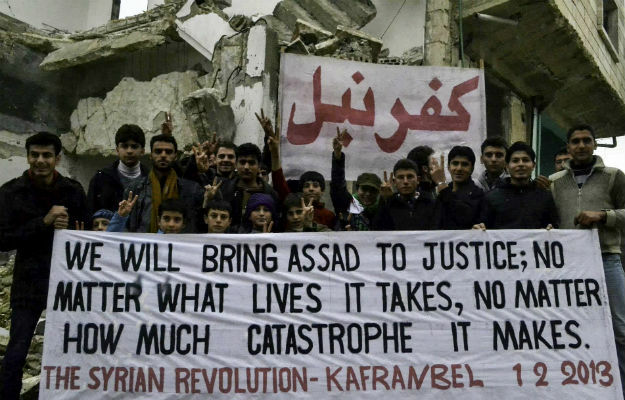 Eventually, Kafranbel — and by extension, Syria — were disappointed by their global audience. Recently, Kafranbel has gone beyond banners to something more sophisticated: “The Syrian Revolution in 3 Minutes” is the latest video produced by the town’s activists. It’s an elaborate production set on a rocky hill. The activists are dressed up as cavemen, complete with bushy wigs and brown sacks wrapped around their waists. Each group’s affiliation is marked by flags: the Syrian people, the regime, the international community, a fat Arab sheikh in a white robe, and an American in a bright red, curly wig. A large group comes out of the cave to protest. They don’t use words, but gesture angrily and lift a single banner drawn on a dirt-brown, ripped parchment. The regime cavemen attack with rifles. They set off a bomb. The people fall to the ground in a heap of dead bodies. The Arab, the American, and the United Nations stand to the side watching, doing nothing. The people emerge from the cave to protest once more. The regime men spray them. They are gassed. They die. The American bystander “tsks” in disapproval and takes away the bright yellow canister of chemicals from the regime cavemen. The people emerge from the cave to protest for a final time. They yell and gesture. They are bombed again. They die. The regime men look timidly toward the three figures, who give a thumbs-up in approval, overlooking the heap of bodies. The message is clear: It’s only the chemical attacks that the world cares about, not the dead Syrians. And what exactly is on this threatening poster lifted by the protesters in Stone Age Kafranbel? It shows a drawing of a cave, its opening blocked with bars. But a single bird escapes, flying away to freedom. Every Thursday evening in Kafranbel, the activists meet in the media center to create the banners for the Friday protest. The “ideas” headquarters is a wide balcony overlooking olive tree orchards, lined with potted plants, cushions, and a large red carpet draped across the wall like a curtain. It is a tranquil space, divorced from the war zone surrounding it. The sound of stray missiles in the distance is collectively pushed to the back of everyone’s minds. One Thursday in June, I visited the town to witness the creative process and participate in the Friday protest. Faris picked up our group from the Bab al-Hawa crossing at the Turkish border. The two-and-a-half-hour drive went by quickly: My eyes were glued to the window, watching my homeland’s landscape pass by. The towns were dotted with destroyed buildings and children playing on the streets. Passing by the ghost towns along our journey, I thought about the dozens of Syrians I had met the week before in the Atmeh camp along the Syrian-Turkish border who had told me they were from these very places. Now they sleep in tents while their homes remain empty. The main square in Kafranbel is a site of destruction, a grim and sad reminder of the regime’s brutality. But unlike some of the ghost towns in the north, Kafranbel is crowded with people — a mix of residents and displaced Syrians. A man rolled out dough for bread in a tiny space between two buildings, one of which was a hollowed-out shell filled with rubble. These scenes are the new “normal” in liberated Syria. In the media center, small groups of people huddle together over laptops. There is a tangle of wires across the floor, as a central electrical outlet powered by a generator charges smartphones and computers. The town is disconnected from electricity for days at a time and land lines have been disconnected for months — but here, notifications from Facebook, Twitter, Skype, Viber, and WhatsApp constantly chime and ring on mobile devices. Some are Googling news events for inspiration, others are researching the Sopranos logo as an idea for a poster, and still others are discussing how to criticize the Syrian National Coalition’s recent elections in Istanbul. As dusk falls, the carpet that had shielded the balcony from the sun is pulled back, the floors are cleared and cleaned, and wide reams of white fabric are rolled out. The groups outside begin to finalize the text for the Arabic and English banners. Jalal does not work with any particular group, but concentrates on listening to the discussions. He doesn’t draw his cartoons here — instead, he goes home well past midnight to draw alone. He returns on Friday mornings with his completed posters, ready to be unveiled at the protest. Discussions revolve around frustration: frustration with the out-of-touch political opposition, frustration with local corruption, frustration that the revolution has taken so long. Activists who started with one big idea — toppling an entrenched regime through the sheer force of the people’s will — have slowly narrowed their scope of work. The grand scheme seems to have shrunk to delivering a single food basket for a displaced family, writing an article, or drawing a banner. As both regime and extremists chipped away at the revolution’s legitimacy, the activists are left alone to recapture the Syrian people’s wavering faith and support. As the calligraphy artists begin to transfer Faris’s messages onto the banners, the atmosphere outside relaxes. Activists and visitors lounge on pillows on the balcony. An FSA general stops by for tea. Bowls of fruit are served. Faris plays a Fairuz song on the oud and a young Syrian-American woman sings along. A muted boom sounds in the distance. Here, despite the despair, hope still seems possible. The revolution still seems alive. Kafranbel’s first banner, raised in April 2011, declared: “Freedom arrived from the fingernails of the children of Daraa.” It’s a reference to the schoolboys who wrote revolutionary slogans on their school walls, igniting the regime’s rage. The security forces’ torture of the boys — which included ripping their fingernails out — sparked protests in this southern Syrian city and marked the beginning of the revolution. Kafranbel was still occupied by the regime then, and the banners placed the activists in grave danger from security forces. At the beginning, they used to burn the banners after the protests out of fear. Sometimes, they threw them in the river. As the popularity of Kafranbel’s posters grew, so did the protests. The witty banners became the pride of the town. People emerged by the thousands to protest during the summer of 2011 and 2012. But then something changed: As the town was continuously shelled and targeted for its open dissent — and as the revolution continued, with no end in sight — many of the residents fled to refugee and internally displaced persons camps. The number of demonstrators dwindled as well, down to a few hundred and then a few dozen this summer. On the Friday that I visited Kafranbel, we assembled in a narrow side street, in a few tight rows. The protest had not been announced to the town and was being held before the Friday prayers instead of afterward, which was the traditional time. We chanted for about 20 minutes. We posed for photographs with each banner. Faris documented the protest for Arabic satellite channels and social media, but the entire experience felt like an act on a stage. We were defiant and well-intentioned, but we were hiding — not just from the regime’s bombs or the extremists’ watchful eyes, but from the town itself. What we didn’t know on that carefree day in June was that this would be one of the last protests in Kafranbel for some time. For six weeks this summer, Kafranbel went silent. The people of the town had been coming to Faris for months. They begged him to stop creating the antagonistic banners and organizing the protests that had attracted international attention. They blamed the protests for the regime’s air raids that were devastating the town. This is the twisted logic that plagues people in Syria. Facing continuously escalating violence, many civilians have directed blame toward the revolution. Obviously, you can’t blame the Syrian regime for being vicious and relentless — that’s just what it is, and always was. It was the revolution that should have known its limits: In many Syrians’ eyes, the revolution had brought death and destruction, invited unwanted extremists, and steered the country to the point of no return. Returning to silence, they reasoned, was the way to end the nightmare that had been unleashed on their country. Faris tried to compromise. He moved the protests to an inconspicuous side street, away from the main square. He banned children from attending the Friday protests and changed the set time of the gathering. Nothing stopped the residents’ complaints. And so after a protest on July 15 that featured a banner dedicated to Trayvon Martin’s family, he stopped. “Without popular support, we can’t do this anymore,” Faris said. At first he was angry — especially when the air raids did not stop. On July 27, during the holy month of Ramadan, the bombs fell at sunset while the town broke its fast. Several people were killed in the now-silent town. And still the people blamed the protests. After a few weeks, Faris’s anger waned. The time off had given him time to reflect. He stopped focusing on what the world wanted to hear and see. Instead, he began to listen to the town, and worked on a plan to regain his lost legitimacy. One August evening, activists set up screens, projectors, and sound systems in five different public spaces across Kafranbel. For two hours, news was broadcast on the screens — a report from Al Jazeera, a compilation of YouTube videos, and a special local news broadcast produced by the media team. Men stopped on the street to watch. They pulled up chairs and lined the sidewalks. Some had not watched the news for months. Others had not seen the YouTube videos at all. After two years of projecting Kafranbel to the world, Faris had brought back the world into Kafranbel. The media team started to put together the broadcasts every day. They compiled videos of the early protests, of the banners shared around the word, and stories about Kafranbel’s martyrs. Faris and his team ignored calls from journalists who asked for new banners and cartoons. They didn’t even create artwork or organize a protest after the horrific Aug. 21 chemical weapons attack on the eastern Damascus suburbs. After a few weeks of these outdoor events, people requested that the protests and banners return. They regained their pride in their town’s defiance. And so on Aug. 30, Kafranbel reclaimed its revolutionary role. Isolationism — which many Syrians view as President Barack Obama’s foreign policy with regards to their home country — works both ways. Many activists inside and outside Syria realize that there is no longer a reason to convince the world to action. No one is coming to save Syria. The collective message of Kafranbel’s body of work is the opposite of isolationism. It’s an awakening to the world after decades of neglect and forced isolation by the Assad regime. Sadly, Syrians have realized their costly awakening has come to an unwelcoming world. The simple yet powerful “Stone Age Kafranbel” video is a case in point. The scene is timeless — beyond history, geography, and language. Whether scrawled on parchment or scribbled on poster board, whether viewed on YouTube or etched onto cave walls, the call for freedom is the heart of revolution. And it now pulses through a small, once unknown Syrian town that both found and was found by its voice — Kafranbel.